Today’s blog post is going to be all about my favourite summer dresses. Anybody that knows me will know that I have never really been a dress kind of girl. Even when the weather is hot outside I will usually just opt for skinny jeans and a t-shirt of a denim mini skirt. But, this year I want to try and push myself out of my comfort zone a little when it comes to fashion and the clothes I wear, so this year I have been trying to wear more dresses. Little did I know at the time that I would fall in love with them and they have quickly become one of my favourite things to wear. I just love how easy they are, they look feminine, relaxed and always look so stunning. So, for today’s post I am going to share with you some of my essential summer dresses. Now, a white sundress is the most perfect thing in my collection. The white sun dress that I have is a really lightweight linen material that is so nice and comfortable in the summer. It falls around mid-thigh and it is sheer perfection. I find that this looks good no matter what I pair it with. I can pop on a pair of tan sandals with this and it is just a great summer outfit. Or if I want to make it a little grungy, I can pair it with a pair of black boots and my leather jacket and it looks beautiful. A white sundress is such a timeless piece to have in your closet, not to mention that it also looks stunning when paired with a nice summer tan. I always make sure I pack white dresses when I am going on holiday. Tea dresses are something that I have fell in love with completely over the past couple of years. There is just something so stunning about how they look. I now have about four different tea dresses hanging in my closet and I love every single one of them for different reasons. They are just a dress that requires no effort for it to look incredible, all you have to do is throw them on and then go about your day. I love how elegant and feminine these dresses make me look and I know that they are going to be staples in my wardrobe for a very long time. I even know for a fact that I am going to carry these through into the winter and pair them with black tights and a jacket. Loads of places are selling these at the moment and I am in love with them. I love simple cami dresses. Over the past year, I have found myself reaching for these more and more. I have a simple black one which I picked up from ASOS and then another with lace trim that I bought from French Connection. The reason why I love these is because they are really lightweight and perfect for going to work in. These just fall in such an elegant way, they don’t cling to any parts of the body and they look really flattering on. Everywhere seems to be selling these at the moment and you can get them for really good prices. I would highly recommend getting these because they are a great basic item to have in your closet. Swing dresses are something that has seen me through many summer holidays and I reach for them all of the time. Some of my favourites that I have bought over the past year are from Missguided. They are nice material and pretty thick. They are quite low back, but they hide your modesty at the front. They fall around the mid-thigh and they are just lovely and floaty dresses to have. What I love about swing dresses in particular is because of their A-line kind of shape, they hide your figure, so if you are over indulging on a summer holiday or just having one of those days where you aren’t feeling your best, they hide a multitude of sins and look really pretty and effortless. This is going to be the last thing that I am going to mention, but it is in no way my least favourite. 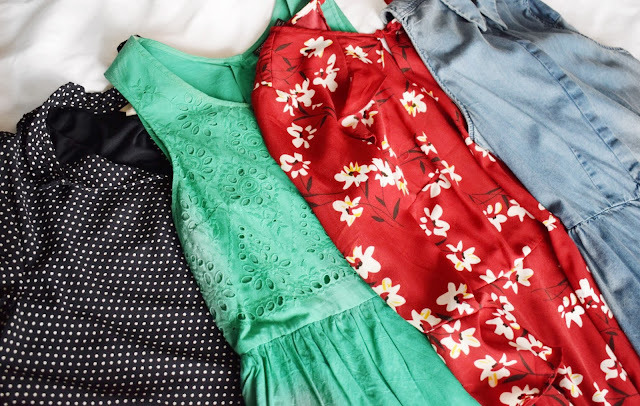 For an everyday basis, whether it be for going to work or just running errands, these are the dresses that I like to reach for. I have these in a whole array of colours and fits, but my favourites are ones that I picked up from H&M. These are tight fit bodycon dresses, that are made from a nice and soft cotton fabric, they fall just below the knee and they are an amazing summer dress. What I love about these is that they hold you and show off your figure, without looking like you are trying too hard to show off your body. My two favourites of these are in a black and khaki and I reach for them all of the time! There you have it, some of my favourite dresses that I am reaching for time and time again. I love how these looks and I feel like there are so many ways to style them up in different ways to create so many different looks. Like I said before, I will leave some links down below to some dresses in case you want to check them out. Make sure to leave me a comment down below and let me know what your favourite dresses are at this time of the year! I tried to do some baking on Thursday evening and gave it up as a bad job halfway through, it is far too hot here at the moment! Aww thank you, I have been loving wearing it at the moment! Thank you honey, glad you enjoyed it! I haven't owned jeans for about 10 years. I live in skirts and dresses, mostly dresses. I own about 65 dresses. (I really need to go through them, though I do by most of them second hand) I feel a lot more comfortable in dresses. They're so many different styļe of dresses to chose from. My favourites would have to skater dresses or 50 style dresses, Lindy Bop does some beautiful vintage looking dresses. I hate jeans, I can only have them on for a short amount of time! Wow they look so lovely!! I know that At some Chinese e commerce shops you can find a lot of trendy dress with really low price, like Wish and Zaful. I would never think to look there, thanks for the suggestions!